Pour melon liqueur, sweet and sour mix and club soda into a shaker with ice. 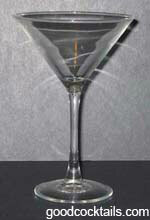 Shake and strain into a chilled martini glass. Add the float of 151 on top and ignite.